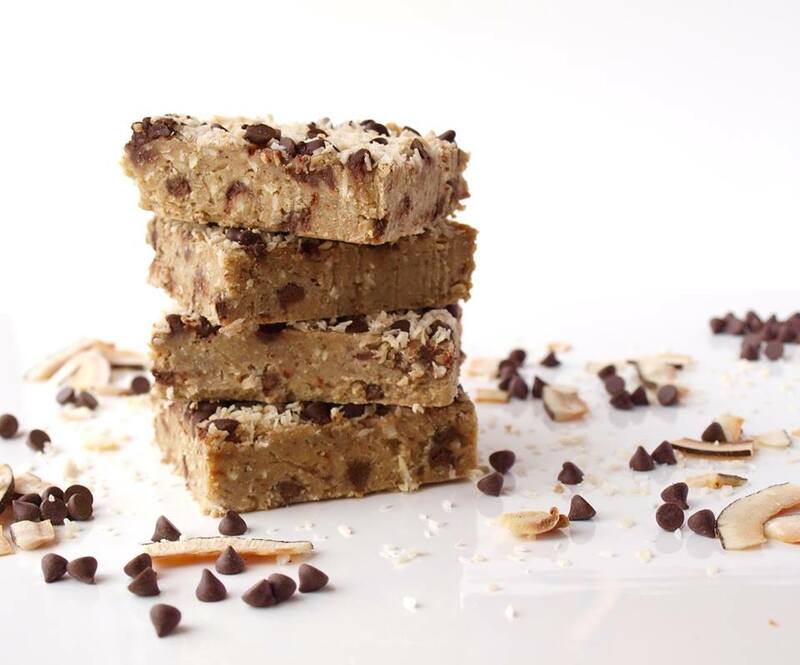 Ok, ok…we just can’t hold our excitement for this Local Feature Friday with what we may call a soulmate company that makes seriously delicious desserts- meet Shockingly Healthy. You won’t even be able to tell that these desserts are actually good for you- they’re rich, flavourful and just sweet enough! The best part is that you won’t get that sugar crash because they’re rich in fiber and protein that will keep your blood sugars stable, your energy levels high and your belly satisfied. Chickpeas in a brownie? …It can’t get healthier than that! 1) Lauren, we are beyond excited to be here chatting with a fellow Nutritionist that has the same love for chocolate and desserts that make your mouth water but are also super nutritious. Could you tell us a little bit about how you got started, and what inspired you to make the world a happier place through ‘shockingly’ healthy desserts? I have always loved dessert! In my home growing up we’d say “a meal is not a meal without dessert”. Like so many people, I struggled with my weight while growing up. It was really when I got into the whole clean eating movement that things fell into place from me. I began to focus on nutrient dense foods, and healthier versions of what I wanted to eat. I learned to crowd out the bad with the good…and then, I got really creative with clean versions of traditionally unhealthy things. I’ve always had a knack for recipe development, and when I started studying nutrition I started a food blog. This was a great way to keep track of my experiments—and if something was great it was repeatable. Through the blog I had fellow nutrition students asking if I’d start selling anything. I knew part of why I’d started making my own stuff was because there was nothing on the market that met my needs, and through being in the world of nutrition (and working as a personal trainer at the same time) I really became in touch with what a universal wish this was—who wouldn’t want desserts that taste amazing that are so much better for you? So I started selling the very same brownies and blondies I make now to nutrition students at lunch, and my personal training clients. 2) At The Naughty Nutritionists we don’t like to place restrictions on eating, we rather focus on finding the healthiest version of the foods we love and creating balance in our lifestyles. And, that is why we enjoy our desserts, chocolate and occasional glass of wine with pleasure. At Shockingly Healthy, what would you say your motto is? That’s such an awesome philosophy…and it’s pretty much in line with my motto! I really think that if we try to cut stuff out too dramatically, or feel our diet is super restrictive that it can only last so long. The best thing is to find the healthiest way to make something you love and want to eat. It’s amazing how much better you feel when eating health promoting food…that you really start not to crave true junk…and at the same time, life is short, and if there’s something you really love, you should totally enjoy it in moderation and without guilt. 3) We know that all your products are made of whole foods without any unnecessary additives or added sugar. How do you come up with the perfect dessert combinations? Also, can you tell us where you source and package your products? I follow my cravings and requests of family and friends. I like the challenge of taking something that seems ridiculously indulgent and creating a healthy version, using whole foods wherever we can (the main ingredient in 2/3 of our squares is whole chickpeas that we puree!). There’s a lot to learn from more traditional cooking and baking…but then I take that and almost ignore the types of ingredients that are being used and go with my own healthier staple ingredient. We make and package all of our products in our Toronto-based factory. We carefully source our ingredients to ensure there is no cross contamination with gluten and dairy. Though some of our ingredients, like dates, don’t grow in Canada, we aim to be local where we can. I’m proud to say that the main ingredient of every Shockingly Healthy!® item is Canadian! The chickpeas in our squares, our peanut butter, and the gluten-free oats and oat flour used in our cookies are all Canadian. 4) It’s no secret, we absolutely love chocolate. We get organic, fair trade and always 70%+ dark cacao. Is there one thing that you are obsessed with right now? Not to brag, but my favorite type of chocolate to eat is not super professional (it’s not tempered and it’ll melt so you want to store it in the freezer), but I love making chocolate mixing coconut oil, raw cacao and maple syrup. I melt it and then blend (maybe add some chia seeds) and will often pour it over a bunch of almonds. As far as store bought brands I like Endangered Species sea salt almond flavour. Living Libations is a super artisanal brand that makes some really cool products—they’re rich and complex…almost like a fine wine version of chocolate. This is my take on their chocolate. 5) We see some pretty fun recipes using your brownies and cookies. We’d love it if you share a healthy dessert recipe with us. I love pies…but I find I often skip the crust because crust can be time consuming, and extra work if you’re looking for instant gratification in a dessert! One of my fave ways to use our brownies is as a crust in virtually any recipe. 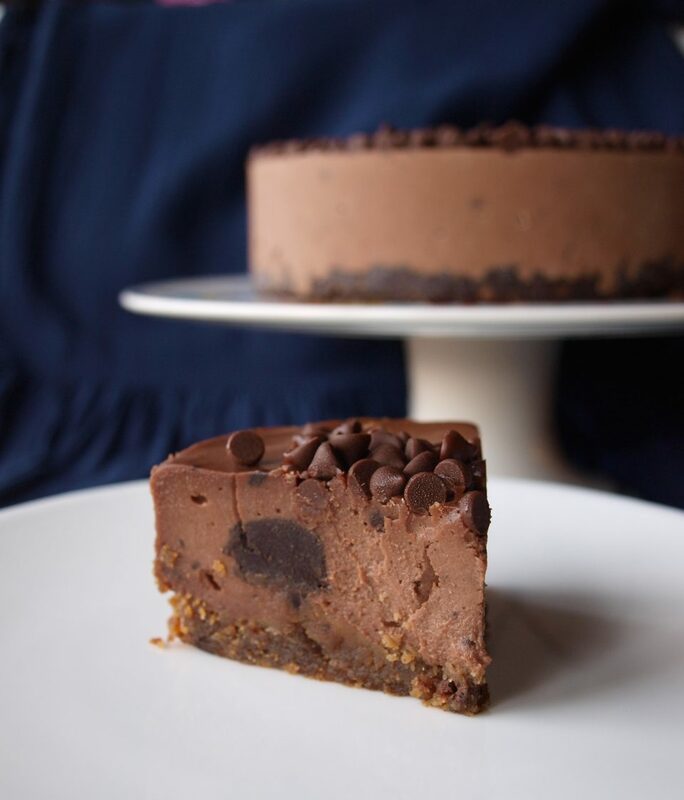 Here’s a cashew cheesecake I made with brownie crust! 6) What is next for the Shockingly Healthy? Do you have any new desserts and products in the pipeline? While I love working on new things, we’ve just taken a really big leap in terms of distribution of our squares, so our top priority is to work on servicing all the new accounts we have as we grow from a GTA focused business to one with national distribution. That said, we are always thinking about new things we can do with any spare moment we get. We are experimenting with increasing the level of protein in our brownie, or developing a separate protein brownie. 7) Mmm, that sounds delicious! Where can our readers find your desserts? The best place to see where we are sold is by plugging your postal code into our store locator on our website. We’ve been in business in Toronto for over 4 years so we have lots of distribution in the GTA. Right now is a really exciting time for us, having just launched with a national distributor. Our goods will be popping up everywhere (in the health and independent grocery channel). Last week we just found out a store up in the Yukon called Riverside Grocery is carrying our goods! In Vancouver Pomme and Meinhardt are carrying it, and Whole Foods is coming soon. Planet Organic should have inventory soon in Edmonton, Calgary and Victoria (we’re already stocked there in Mississauga). We are always making new store announcements on Instagram and updating our Where to Buy page. If anyone would like to see our goods somewhere they aren’t stocked it’s often really effective to make request at your local health food retailer. We’ve even got a form you can pass along here. As a small business we really appreciate customers making requests!